Destined to be one of your favorite T-shirts. 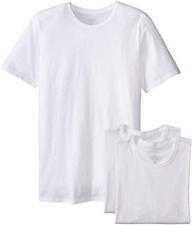 A modern slim fit and ultra-soft cotton comfort blend fabric make this style from Calvin Klein a wardrobe must-have. Short sleeves. Brand New With Tags! Size: U.S. Men’s Medium Color: White/Purple Calvin Klein Jeans Regular Fit 100% Cotton Made in Guatemala T-Shirt comes from a smoke and pet free home Thanks for looking! Calvin Klein. Cotton Stretch and shape retention. Made of 95 % Cotton and 5% Elastane. Color: Black. Machine Wash Cold; Imported. Color:Standard White. Give us a shot and we will make sure that you will look to us again! You're already purchasing the item. Graphic Chest. Short Sleeve. 29" shoulder to hem. 100% Cotton. Super-soft cotton finished with a clean stripe print and a contrasting denim pocket make this T-shirt from Calvin Klein Jeans the perfect choice for a fresh casual look. Stripe print at front. Machine washable. Calvin klein men stretch classic polo white & black logo T-shirt ,size medium . calvin klein t shirt men Medium Size Nice Price. Condition is New with tags. Shipped with USPS First Class Package.